When cooking during the holidays, it can be hard to keep track of the nutrition (or lack thereof!) in your tasty treats and holiday helpings. With these 5 healthy holiday recipes, you can indulge in flavor without overloading on the calories! 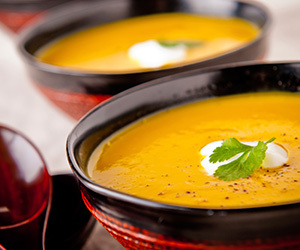 Butternut Squash and Carrot Soup is a nice first course for your holiday meal. In a large covered saucepan cook 3 cups peeled, diced butternut squash, 2 cups thinly sliced carrots, and ¾ cup thinly sliced leek or chopped onion in 1 Tbs hot butter over medium heat about 8 minutes, stirring occasionally. Add 2 cans of reduced-sodium chicken broth. Bring to boil; reduce heat. Simmer, covered, for 25 to 35 minutes or until vegetables are very tender. Cool slightly. Pour vegetables into a blender in small batches and blend until smooth. Return to stove top and add ¼ tsp ground pepper & ground nutmeg. Return to boil, stir in ¼ cup half-and-half or light cream. Remove and serve once soup mixture is heated thoroughly. Vegan Garlic and Parsnip Gravy boasts only 35 calories per serving! Now you can have your favorite holiday topping with less guilt! Preheat oven to 350°F and roast garlic clove for approx. 1 hr. Let cool slightly, then squeeze garlic from husk. Place 1 medium (3 ½ oz) parsnip, peeled and cut into ½ inch thick slices on baking pan lined with parchment paper and bake until soft (approx. 30 minutes). Combine ⅓ cup blanched slivered almonds with ½ cup boiling water and let sit for 30 minutes. Add roasted garlic & parsley, 4 tsp liquid aminos, 1 ¼ cup vegetable broth, ½ tsp fresh thyme, ¼ tsp black pepper. Place all ingredients in the blender. Blend until smooth, about 2 to 3 minutes. Transfer to a saucepan and simmer 3 minutes. Add more broth if gravy is too thick. Smashed Potatoes - boil either golden Yukon potatoes or red potatoes with a pinch of salt until tender. Arrange in a single layer on cutting board or baking sheet and let cool. Using a meat tenderizer, gently “smash” the potatoes. Lightly oil a griddle over medium/low heat and sear potatoes in skillet (3-5 at a time) turning once until potatoes crisp. Add fresh rosemary while grilling. Transfer potatoes to a cookie sheet, sprinkle with salt, pepper and place in oven at 200°F to keep warm. Green Beans with Olive-Almond Relish - a tasty update to your green bean casserole. Steam fresh green beans until barely tender (approx. 8 minutes). Combine green beans with 2 tsp prepared green-olive tapenade, 1 tsp lemon zest, and 2 tsp lemon juice. Top with almond relish (¼ cup sliced and toasted almonds). Roasted Beef Tenderloin - skip the turkey and go for a tender savory roast beef instead. Preheat oven to 400°F. Combine 1 Tbs olive oil, ½ tsp rosemary, garlic, black pepper & thyme, and 1 ½ tsp salt. Mix well and rub over beef tenderloin. Heat 1 Tbs olive oil in skillet and sear both sides of tenderloin until golden brown. Meanwhile, combine 5 chopped and peeled carrots and 1 lb red potatoes with 1 tsp rosemary, salt & ¼ tsp pepper. Transfer potato/carrot mixture to an oven safe dish and top with tenderloin and pour ⅓ cup reduced sodium broth over all. Place dish in oven and cook 20 to 25 minutes (or until internal temp. of beef is 130°F). Remove beef from dish (cover with foil to keep warm) and continue baking potato/carrot mixture for another 10 minutes. Combine all and serve.